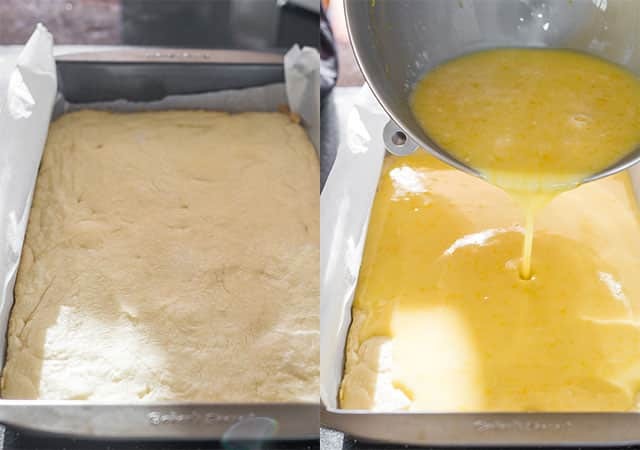 A classic recipe for Lemon Bars with a shortbread crust and a tart and lemony curd filling. 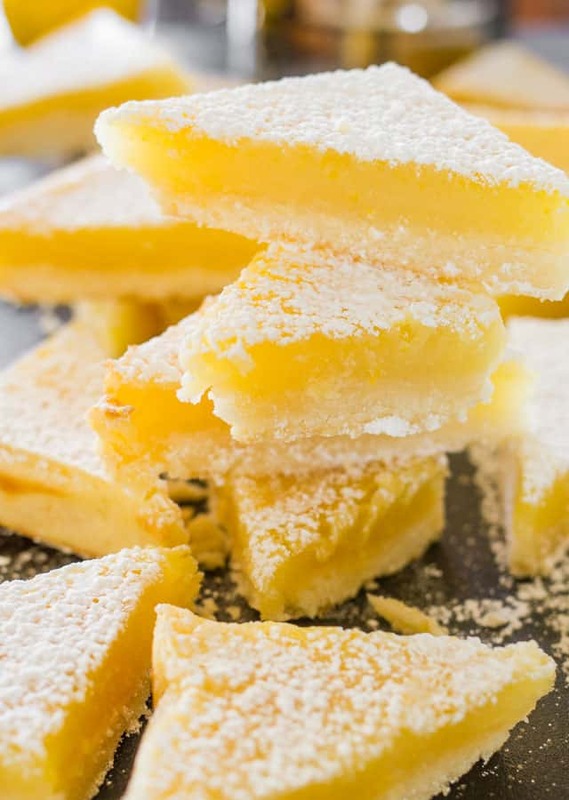 These lemon bars are luscious and totally scrumptious. Lemons, lemons, lemons! Meyer Lemons! When life gives you lemons you make lemon bars or lemon chicken piccata! I’m still working my way through all the Meyer lemons I bought. 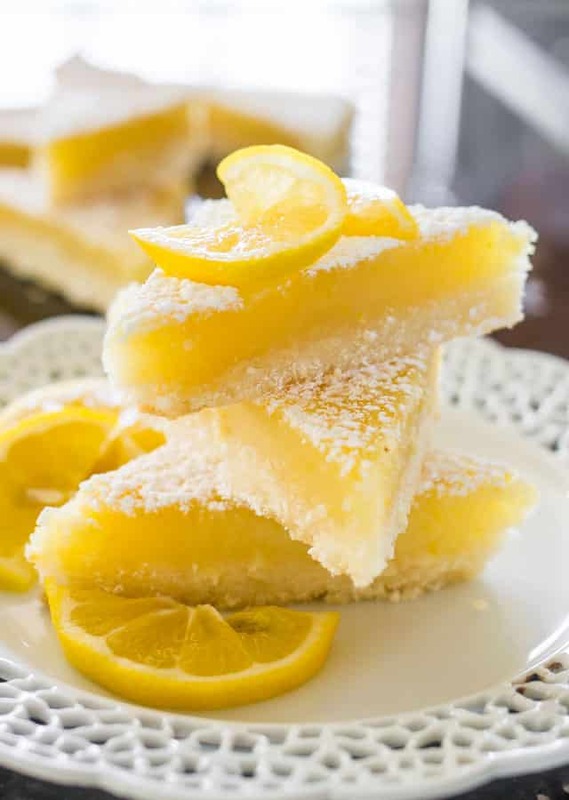 These lemon bars though, are so good and such a great use of those Meyer lemons. They were totally worth it. 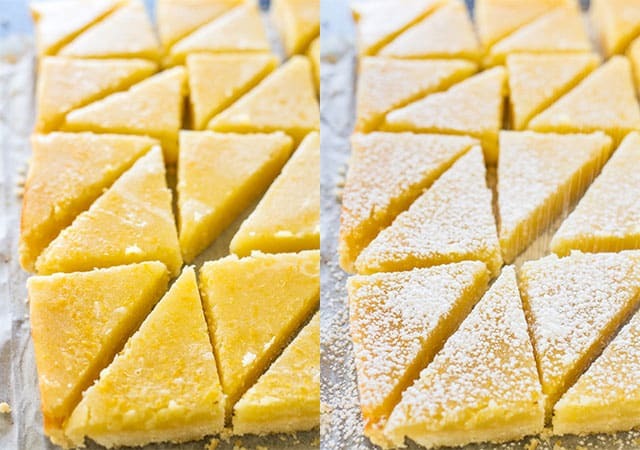 If you love lemons, or lemon bars, or anything lemony, you must try these lemon bars. One of my favorite chefs is Ina Garten. I love her cooking style and this is why I chose her recipe for lemon bars. I’m glad I did because these are the best lemon bars I’ve had. They’re sweet, tart and lemony, just what you want in a lemon bar. 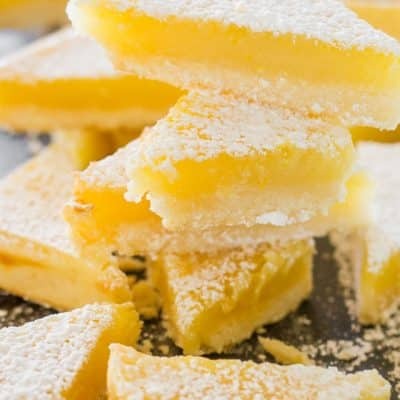 These lemon bars start with a simple yet delicious shortbread crust, that basically requires only 3 ingredients; flour, butter and sugar. To make it easier to remove the bars I lined my baking pan with parchment paper and left the edges longer. This ensures you can easily pull out the bars by lifting up the parchment paper. Great tip and not only does it make it easier to lift out the bars, but you will also end up with a pretty clean baking pan. Not much scrubbing and cleaning required. This is really simple to make. You just have to use your hands to flatten out the shortbread dough and make sure the entire surface is covered. Pop the shortbread in the oven and bake for about 20 minutes, just until you see the edges start to brown a bit. While the crust is baking in the oven you can make the filling. You’ll need about 2 tbsp of lemon zest. I was able to get this from 3 lemons, but it could differ for you. 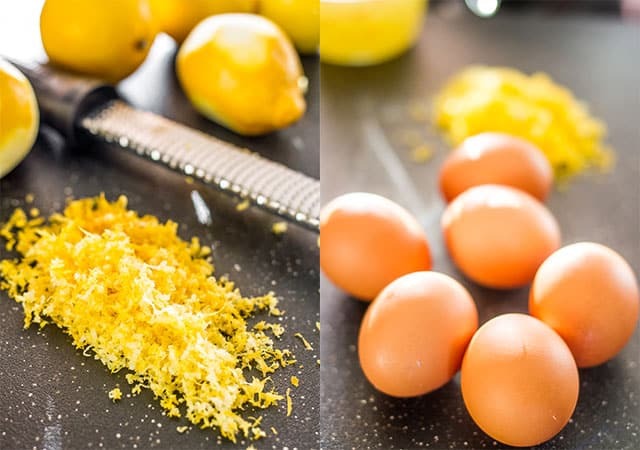 You’ll also need 6 eggs at room temperature and about a cup of freshly squeezed lemon juice. I needed about 7 Meyer lemons to get 1 cup of lemon juice. Once your crust is done, you need to let it cool at room temperature. Once cooled, you can pour the filling over the crust and pop it back in the oven to bake for about another 35 minutes or just until the filling sets. Let the whole thing cool at room temperature. It will smell delicious and you will be tempted to cut into it, but try and resist. This is where the parchment paper comes in handy. Just lift up the edges and the whole thing comes out easily which makes it super easy to cut. You can cut into squares or triangles, totally up to you. I just thought triangles look cuter and since my squares were pretty big, triangles would make for a more normal portion. And of course to finish off these puppies, you need to dust them with some powdered sugar. Totally yum and worth the effort, though honestly, not a lot of effort is required. The answer could vary because there are variations between fruits and they are all different sizes. Usually 1 lemon yields 3 tablespoons of juice and 1 lime yields 2 tablespoons of juice. I find the same is true for Meyer lemons. While they are juicier, they are a bit smaller and we get the same amount of juice from one. Of course, as with any baked goods, lemon bars are best when enjoyed within 24 hours. Make sure to chill the bars until firm. I like to to do this in the refrigerator because they chill faster, in about 30 minutes. Once chilled, slice the bars and store them in an airtight container, using parchment paper or wax paper to keep the stacks separate. They’ll last in the fridge like this for up to 3 days. The great thing is that these bars also freeze well. They could last up to 2 months in the freezer if store properly. PREPARE BAKING PAN: Prepare a 9x13 inch baking pan with parchment paper, make sure the parchment paper is long enough to come over the sides, this will make it easy to pull out the bars. MAKE CRUST: In the bowl of your mixer add sugar and butter and beat using the paddle attachment until light. Add flour and salt and mix until the dough starts forming into a ball. It will still crumble easily. 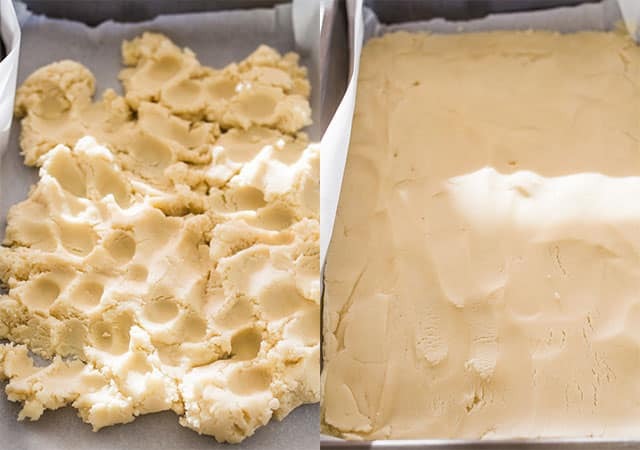 Dump the dough into the prepared baking dish and flatten using your floured hands. I straightened mine out with a spatula, but it's not necessary. BAKE CRUST: Bake the crust for 20 minutes, until very lightly browned, you'll start seeing the edges brown. Let it cool and leave the oven on. MAKE FILLING: Whisk together all the filling ingredients. Pour over cooled crust. 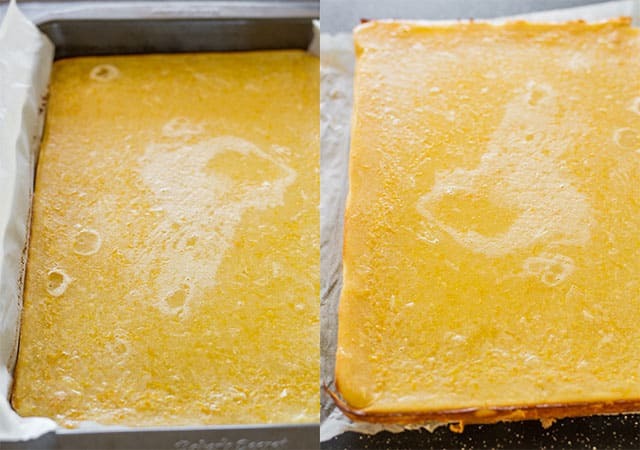 BAKE LEMON BARS: Transfer the baking pan back to the oven and for another 30 to 35 minutes or until the filling is set. Let it cool at room temperature. Store in an airtight container. These lemon bars also freeze well. This recipe will yield about 24 triangles, depending on how big you cut them. These are the best lemon bars that I have ever made, and the best shortbread crust that I’ve had too. I will be making these again. Thank you! Cut them into squares, and then cut them in half diagonally! I’ve used Ina’s lemon bar recipe, and it calls for one cup of flour in the filling. Your recipe doesn’t call for flour in the filling. Could that be why some people had trouble with the recipe? Good catch, fixed the recipe. My bars inverted themselves. The crust embedded up on top covering a mush of lemon goo. Even with extra time bashing the lemon part didn’t seem to pull together too wonderfully. Thankfully I’m not opposed to ugly looking sweets, but they didn’t make an appearance at the luncheon i was invited to. The site is only allowing me post 5 stars. Hi there. Have never made lemon bars or used Meyer lemons before and cannot find Meyer lemons right now. If I use regular lemons, do I use the same amount of lemon juice? Do I need any extra sugar? Your photos look delicious. Yes, I would follow the recipe exactly as written with same quantities. In order to use meyers lemon you need to plant a Meyers lemon tree. Mine is wonderful with plenty of supply in winter. Big and juicy with w different flavor than store bought. Store ones will work. I made these and they didn’t come out right! After reading the comments you said to let the crust cool for two hours!? The recipe says to take out the crust to cool but leave the oven on which lead me to believe you let it cool while you were prepping the filling. Why would you leave your oven on for two hours? Confused! You don’t have to leave the oven on, of course you can turn it off, but just turn it back on a few minutes before putting the pan back in the oven with the filling, just make sure the crust is cooled off before adding the filling to it. I made this tonight, I’m just waiting for the finished product to cool down. I can’t wait, it was so easy to make! I am a little worried about the crust though, I just don’t know how it will hold up against all that liquid. BUT, I loved making this. it was a lot of fun. Jo, these are beautiful, bright, and cheerful! Perfect pick-me-up for the gloomy skies we are getting here in the Twin Cities. Lemons always bring out the sunshine…at least, in the kitchen 🙂 Your bars here look absolutely stunning. Jo, I made these yesterday and they turned out exactly. What a great and simple recipe. Thank you so much, my family totally enjoyed these and we have some left over for Christmas too, as I took some and froze them. Thank you again for such a great recipe. I made these yesterday and for some strange reason, it’s as if the shortbread crust has “dissolved” away. It’s just not there. . .. I let them cool at room temperature and then refrigerated them, as directed and when I pulled them out with the parchment paper and tried to cut them, it’s just like trying to cut nothing but the curd. The flavor is good but, I’d have to serve and eat them with a spoon and it’s not very good to JUST eat lemon curd. What could have possibly happened? My crust looked exactly like your pictures; as a matter of fact, everything LOOKED like your photos, except for “end result”. Any ideas? The only thing I can think of is you didn’t let the crust cool completely, but as I’m not there in the kitchen with you I can’t tell you exactly. The crust also needed to be at room temperature before pouring the lemon curd over. No, I totally let the crust cool, as directed. Funny thing. . .I finally just pulled the parchment completely out and was going to throw them away when it occurred to me. . .”Hey, just flip them over.” It seemed as though the “top” of them was hard and crusty and the bottom was soft and “curdy”. So, I did just that. . .flipped them and they taste lovely. The crust rose to the top and the curd sunk to the bottom for some reason. Because of that they aren’t EXACTLY perfect (the curd is too soft and jelly like, but has a wonderful flavor). I have NO IDEA how I did that. I’ve make lemon bars many times before and I’ve NEVER had that problem. They still taste lovely though. Thanks for the recipe!!! I had the very same thing happen! The crust rose to the top and the lemon curd is on the bottom. Why would that happen? I have made lemon bars for years, but this is the first time I used this recipe.. I had the exact same thing happen to mine. I bake a lot and followed the directions exactly. So weird.. Thankfully I read your comment before I threw them out. I was able to flip them over scrape some of the curd off and save them for the bridal shower I’m going to tomorrow! Thanks! 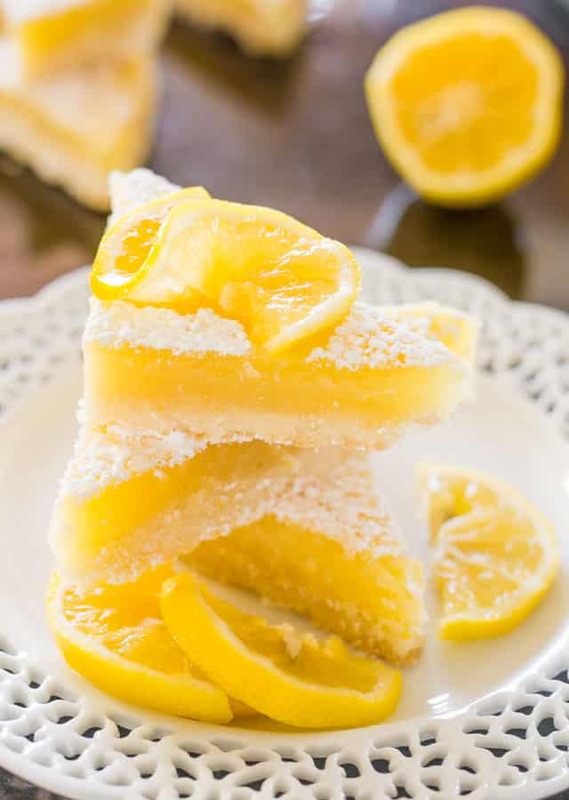 Awesome & very lovely lemon bars……looks very inviting. I love lemon bar! How long do you let the crust cool before pouring in the filling? About 2 hours, just until it was at room temperature. Happy Holidays to you too Candice!